Although not plentiful, Pender Harbour trails are some of the best on the lower Sunshine Coast. 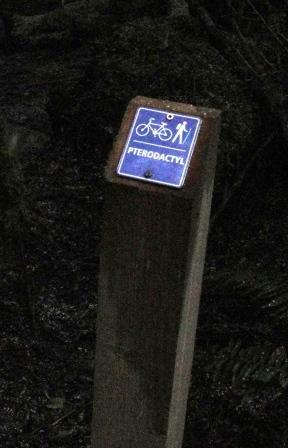 The Pterodactyl route is a trail that will take you about an hour to hike and somewhat less if you are riding. The ride is a little technical, but no real climbing involved. The image below is actually interactive. It is a Google Earth gadget that embeds the image of the trail route that you can zoom in and out of with the zoom bar on the right. You can also use the slider bar to back up through my route. It's pretty cool. Oh, you can close the bubble to get it out of your way. This route starts at the Connor Park parking lot. Connor Park is in Halfmoon Bay and is reached by turning left on Redrooffs Road from Hwy. 101, approximately 10 minutes driving northwest of Sechelt. Drive along Redrooffs Road until you reach Southwood (3rd road on your right, about 3 kms). Turn left on the first road on your left which is Westwood. 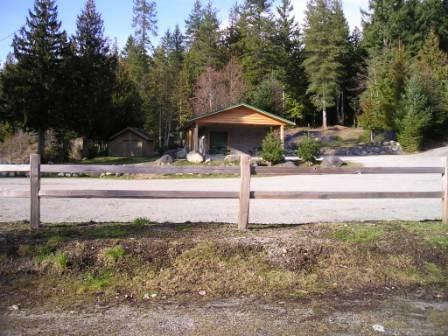 At the end of Westwood go straight ahead into the park via the gravel access road and park in the lot. If you are parked facing the washroom building, the Connor Connector trail starts straight ahead of you and is marked with a post with a blue marker. Follow this trail up the hill and past the park. Turn left at the first trail which is Sprockids Run. Follow Sprockids Run to the next trail (Pick It Up) which you want to cross and go straight into Out & In. 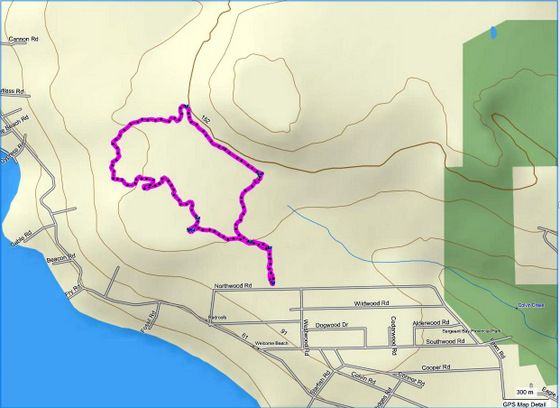 Out & In is a pretty easy ride and will take you out to the Water Tower Rd. where you turn right and then immediately right again into In & Out. The first trail on your left is Pterodactyl. This trail meanders along over ramps, bridges and across boardwalks and is a couple of kilometres long. There are some rooty areas and large rocks to make your way across until you come out on Datsun Alley. Turn right at Datsun Alley and follow this trail a kilometre or so until you come to the first trail on your right. This trail is Pick It Up. Follow it up the hill past the entrance to In & Out on your right, and Midway on your left. Turn left at the next trail which is Sprockids Run again (or keep going straight and you will come out at the end of Connor Park). Take the next right on Connor Connector and back down to your car. Click here to return from Pterodactyl to the Bikes & Hikes page. Click here to return from Pterodactyl to the Sunshine Coast Trails Home page. I began this site as a labour of love and in response to what I believed was a need to have one comprehensive website with detailed information about all trails on the Sunshine Coast. So if you have a moment (and a Facebook account OR Yahoo, AOL, Hotmail) please leave a comment in the box below.